"The Great Levithian!" "Orichalcos NO KEKKAI!!" The above info came from Katherine, and was edited by yours truly (contact me). The image came from www.yu-gi-oh.ch. Dartz was once the king of Atlantis who, ten thousand years ago, lived in peace with his queen... until exposure to the meteorite of the Orichalcos. It took over peoples minds, turning them all into monsters, including his Queen. Falling under its spell, Dartz has since spent millenniums capturing souls of people in order to awaken the most powerful creature ever known, the Great Leviathan. In the modern day, he has convinced Valon, Alistar, Raphael, as well as Mai Valentine, Rex Raptor, and Weevil Underwood to serve as his Orichalcos enforcers to capture the souls of others. In addition, he has a vast army of Orichalcos soldiers. His main targets are the souls of Pharaoh Atem (Yami Yugi), Joey Wheeler, and Seto Kaiba. In the end, he merges with the Great Leviathan. What happens next is unknown. The above description came from Jeff Z and Katherine, and was edited by yours truly (contact me). Years ago, there was a raging battle between the good dragons, led by Iron Heart, and Kurisu (Christ), versus the evil Rock Phantoms, and Dartz, with his black dragon god. Taimeous, one of the three powerful dragons, destroyed all the Rock Phantoms with one blast. Taimeous then charged at Dartz. Dartz used his lighting and blinded Taimeous with a sword of lighting through one his eyes. Dartz's dragon then began his attack on Taimeous, and Taimeous used his attack on Dartz's dragon. Yami no Yuugi witnessed the flash back, but then lost it when the two attacks collided. Dartz returns, but with followers. How did he round up followers? He uses a persons' hatred and promises them revenge on what they hate. Once the person agrees, he pulls out a kind of gem (called Orichalcos stones) and tells them to touch it. Once they touch the gem, which appears to be jade, the person gets a kind of bizarre geometric star on their forehead. That represents their hatred. The also get a magic card that has the geometric star on it. They take the card, and they take a jade necklace, which will be used for a "DEADLY" duel. During a duel, when the person draws the geometric star magic card, they place into a slot, on the side of the duel disk. Once inserted, the symbol appears in the sky, and falls to the ground, with the duel currently in play. The EVIL Person and the "victim" are then surrounded by the geometric star. Once set on the ground, the star appears on the EVIL person's forehead, which also gives that person's monsters, a power boost. The "DEADLINESS" of the duel is that, the person who looses the duel, the geometric surrounds only the loser, and takes their soul, which is then sealed in a temple, surrounded by the ocean, where Dartz waits for each new soul. He uses the souls to summon his Orichalcos God. Dartz sent one his deceived people to duel Yami no Yuugi, Raphael. Yami no Yuugi got the geometric card for an exchange of some other magic card. During that duel, Yami had a jade necklace that Rebecca gave to him. Yami decided to use the DEADLY star and seal away Dartz's deceived person. Yuugi warned him not to use that, but Yami didn't listen. He played the card, which then made his heart turn from a pure one to a dark one. In the end, shockingly, Yami lost! While the star was powering up to the take the soul of Yami, Yuugi pushed him out of the way and told him that he believed in him. Yami was heartbroken, and he cried for his little friend! Dartz noticed that there were two Yuugi's. He really wanted the "Namonaki Pharaoh's" soul because it full of great power that would give the Orichalcos God a huge boost; however, he got Mutou Yuugi's soul instead. Ryuzaki and Haga wanted to join Dartz's group. Dartz allowed them. Ryuzaki dueled Jounouchi, while Haga dueled Yami no Yuugi. Haga was teasing Yami no Yuugi that he lost his "Aibou" (Yuugi). Yami Yuugi's darkness broke free, and he used to one of his swordsmen (Duel Monster) to win the duel, which he did, but he also tried to kill Haga!! Haga and Ryuzaki, in the end, both lost, and lost their souls. Dartz was outraged! What pathetic duelists these two were! Dartz also has a power to call upon rock phantoms, which can be used to seemingly kill people, or duel them, and then, take their soul. Interestingly, he seems to use the aurora of the sky as a kind of weapon, it seems, or I'm delusional. He used it once, from what I've seen. He called upon the past, when Taimeous hit Dartz's dragon in the eye, which shattered like glass. Then, fragments of jade fell to Earth. He called upon "his" god, and created a spell on the entire world to have Rock Phantoms appear. While the aurora was in effect, he sent green comets to power up the jade fragments on Earth, which then created Rock Phantoms, to take people's souls. Dartz most faithful duelist is Varo. Overall, Dartz may look cool, especially with a gold eye and a green eye, but he is quite diabolical. Right after Raphael was lost in the collapse, a group of people talked to the gang, telling them that they had to beat DOOM. Otherwise, the world would be DOOMED. In that case, the entire gang went to Dartz's temple in the ocean (where he was located). Dartz was there, chanting up a storm, that created waterspouts in the ocean, as the KC Chopper headed to the temple. They look for Dartz and find him in a room full of stone figures (which are souls)! There had to be at least a couple thousand of them. Some people came from Ancient Greece, not of Dartz's time period. Once the duel started, Dartz used the geometric star card, Orichalcos NO KEKKAI! Instantly, Kaiba, Yami Yuugi, Anzu, and Mokuba felt an ominous darkness among him. Dartz was NO ordinary person. Then Dartz revealed his history. Turns out, about 10,000 years ago, he was the king of Atlantis. One day, a volcano erupted, casting volcanic rocks into the city, that turned out to be Orichalcos. A serpent also appeared (in the clouds), and swallowed the sun, casting darkness on the city. Once Orichalcos appeared, the citizens then turned into hideous-looking monsters! Dartz's queen, Iorei, also changed into a monster. When he saw that she had killed a servant (the US version does not show this), he had to no choice, but to kill her, which he did. He then went outside, and saw that the entire water supply was now just blood while he heard the screams of his people. Suddenly, a water fountain glowed neon green (the water glowed). Dartz went into the fountain to view the source and found a green stone, almost like jade, which was the cause of the monster changing. He picked up in his hand instantly turning his right eye from gold to green; he then saw an image of the serpent god, hidden in the earth. At that point, he saw his god as way to destroy the corrupt human society. He was then cursed with Orichalcos! His Father, Iron Heart, and his daughter, Kurisu (Christ) found out what happened, and tried to stop him. However, Dartz laughed and created rock phantoms. Iron Heart and Kurisu fled, and then called upon Legendary Dragon Timaeus, Critias, Helmos, and many other duel monsters to appear, and a war was waged against Dartz, his rock phantoms (Orichalcos Soldiers) and his serpent god. It is summized that Dartz the lost the war, but he lived for another 10,000 years. Right now, that's where Amelda, Varon, and Raphael come in: to duel people, and take their souls for Dartz's god. However, he framed all of them to create darkness in their hearts so they work for Dartz to eliminate all of the corrupt humans. Of course when Raphael hears this, we tries to kill Dartz, but he ends up killing himself accidently when he lets the darkness in his heart to take over, creating the seal around him, and killing him. After Raphael's "death," Dartz activated the last and final seal of the Orichalcos Seal; Orichalcos Toritosu. Shockingly, Kaiba looses his soul to Dartz. 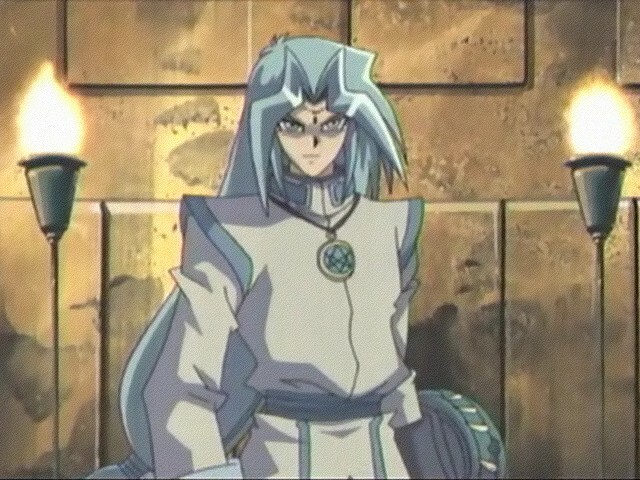 Dartz then revealed a flash back to Yami's memory of Ancient Egypt, when Bakura fled the palace with Diabound. Dartz.. was there! He saw Yami Yuugi riding on a horse, after Thief Bakura, with Osiris. Dartz then said that Yami Yuugi, was darkness itself! In order to banish darkness from humans, he said, Yami Yuugi had to be killed. Dartz then taunted him by telling him that he was "null." At that point, Yami Yuugi then thought he had nothing, so why should he live? He was diminishing. Dartz seized the opportunity to put an end to Yami Yuugi, by sealing his soul! As the geometric star began to encircle Yami, a tear from his eye dropped onto the Millennium Puzzle. Instantly, the puzzle shined, and stopped the star from taking his soul. At that point, Yami then realized he did have something.. the memories of everybody. He wasn't "null." With that courage, Yami drew the magic card, which then revived the human souls of Timaeus, Critias, and Helmos. With the tables turned now, Dartz lost! Suddenly, a dragon devoured Dartz, and then Atlantis appeared! Then, Kaiba, Jounouchi, and Yuugi (only the selected warrior souls were revived) go to Atlantis to find Dartz. However, Dartz is a frozen solid statue. Yami Yuugi then touched him, and he vanished. He then announced in order to revive his god, he would sacrifice his own soul! Soon enough, Dartz calls upon his God (Orichalcos No Kami), and Dartz is fused with the god. Then, the 3 Egyptian God cards appeared, Ra, Obelisk, and Osiris, who fought the Orichalcos god, and killed it. However, Dartz survived, and he resurrected it, but not as powerful. However, Dartz survived. He then revealed the true master behind Orichalcos, the serpent monster inside his hear. The secondary form then attacks Yami no Yuugi. Yami thinks of everything that happened to his friends to give himself courage to kill Dartz. In that case, Yami no Yuugi takes all of Dartz's Dragons' power (which is evil) and makes the evilness consume him (Yami). Suddenly, the destroying flame (which Dartz had created before his God was going to kill Yami, which would destroy the entire world) disappears, and the Evil God is killed. Dartz's evilness is banished from his head, and he looses the green eye color in his left eye. Then, he and his family, return back the ocean, happily ever after.